Turkey or Chicken Newburg is sophisticated enough for adults (that’s the Sherry talking) and kid-friendly, too. That is if your kids will eat mushrooms and peas. Both of mine were ok with the mushrooms. It was the peas that got them, so I usually used a few less than called for. And I guess that’s also if you don’t object to the smidge of Sherry in the dish. It works out to about a teaspoon in each full-sized serving, but I admit attitudes have changed since my kids were small. Since this is a recipe that relies on cooked poultry, that makes this a perfect leftover dish. Minutes to toss together, Turkey or Chicken Newburg makes a perfect weeknight dinner. If you don’t have a big holiday turkey to go through, or leftover chicken (if you’re cooking chicken for another dish earlier in the week, make a little extra just for this dish) it’s still just minutes to poach a little chicken just for this dish. Just cover the chicken with water, bring to a simmer and gently simmer for about 10 minutes or so until done. Cool in the broth if time allows, and then shred. Turkey or Chicken Newburg is one of those old-school dishes that always seems just a bit fancier than it is. And since it’s so easy to toss together, I tend to think of dishes like this for gatherings at a cabin for a ski or snowmobile trip. Serve it over all kinds of things. It’s great over biscuits, toast, and is really good over waffles. Now that’s a Chicken & Waffle I can get behind. 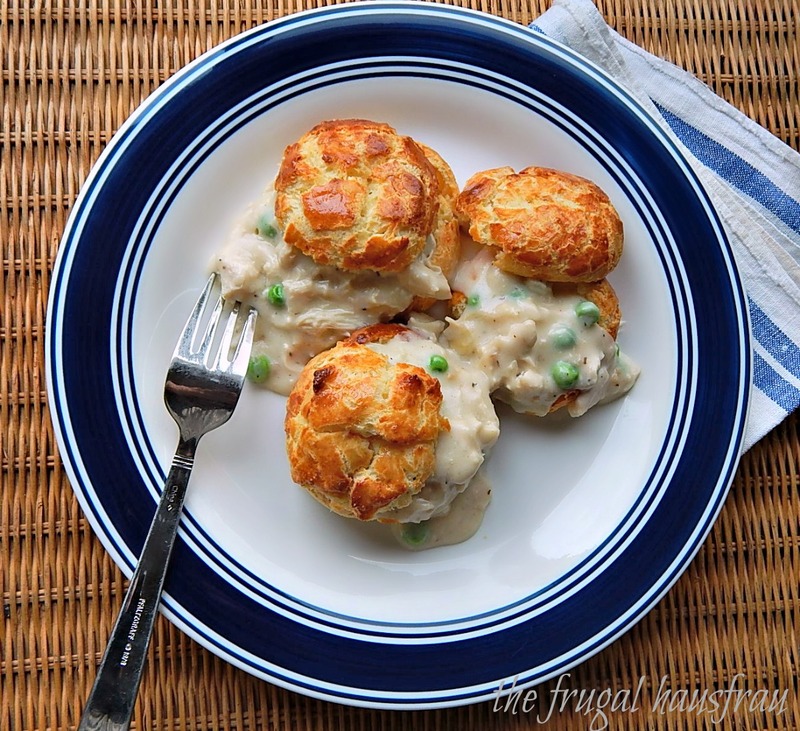 I like it served over popovers, like my Popovers in a Muffin Tin (My Updated Chicken a la King is another dish that goes great over popovers) and don’t forget good old mashed potatoes for the ultimate comfort food. I’m showing it over Cheese Puffs, today, but if you’re making this after a holiday, think of your leftover rolls or biscuits. I just recently revised the cooing process for Turkey or Chicken Newburg. Originally my recipe started out with canned or jarred mushrooms – they were pretty popular back in the day when fresh wasn’t available everywhere, but I’m guessing most people, today, are going to buy fresh mushrooms. Also, a commenter objected to the amount of pepper in the dish and I agree with him. I personally like it with a lot of pepper, but my tastes aren’t the same as everyone else’s, even though I believe (as we probably all do) that I have great taste, lol! I’ve altered the recipe, below, and suggest you hold off on the seasoning until the dish is finished, then add salt and pepper to taste. I think you’ll find this dish pretty straightforward and easy. Just make sure to cook the flour with the butter and mushrooms long enough make sure any raw flour taste has disappeared. And use a whisk when you add the chicken broth. Your mushrooms may get caught in the whisk, but it’s the best way to ensure that there are no lumps. Shake them out after the liquid is incorporated. Look for chicken breast when it hits a low, and it generally will be about once a quarter. If it’s in a family pack, break it down and freeze in portions that makes sense for your family’s needs. Buy extra and freeze and you’ll always have sales priced chicken to use for recipes like this. Because the chicken needs to be cooked ahead time, this is also a great go to when you have just a bit of chicken leftover from dinner the night before, or even a few vegetables in your fridge. Mushrooms vary a lot in price depending on the type and when you buy them. This is a great recipe for the simple button mushroom. Did you know the button has all the same powerful nutritional properties as their pricier cousins? Bonus! I like to check around holidays when mushrooms are often on sale. When you get them home, poke a few holes in the plastic on top, turn the mushrooms over and store upside down. That prevents them from sitting any condensation on the bottom of the package. Ever notice the mushrooms on top of the package look gorgeous but those underneath may not be any good? That’s why. Half and half can be a pricey ingredient. Aldi has great prices for half and half and cream and so does Costco. You’ll also find both half and half and cream on sales during most holidays. Since it keeps well, with its high-fat content, stock up on sale if you use either regularly and remember the “by buy” date is not an expiration date (Did you know there are no “expiration dates” at all? Just by buy or best by dates, both chosen by the producer.) and unopened both cream and half and half last well beyond. In a large saucepan, melt butter. Add mushrooms and cook, stirring, until mushrooms have given up most of their juices and started to slightly brown. Stir in flour and cook for a minute or two, stirring often. Add the chicken or turkey broth in small additions, stirring well after each, then half and half and sherry. Continue to simmer, stirring often, until thickened enough to coat the back of a spoon. Add the chicken, peas, thyme and salt and pepper to taste. Simmer gently until warmed through. This entry was posted in Click here for Bargain Meals, Click here for Fabulous Food Posts and tagged Alcohol, Bargain Meal of the Week, Chicken, Cream, Half & Half, leftover Chicken, leftover turkey, Leftovers, mushrooms, Peas, sherry, Turkey, White sauce. Bookmark the permalink. 1/2 a teaspoon of pepper RUINED my sauce…please re-check your measurements. perhaps you switched the salt and pepper measurements. Evan, my sincere apologies! 1/2 teaspoons of pepper IS a lot and I think you are correct in that the S &P may have been mixed up. I gave the recipe a quick alter, which wlll hopefully prevent any issues for anyone else. Thanks for stopping back and letting me know. I’ll remake this as soon as possible to retest it.